The Gran Teatro, Havana's stunning Old World opera house. Breathtaking. That's the word that keeps cropping up when I try to describe Havana, after traveling there twice in June. 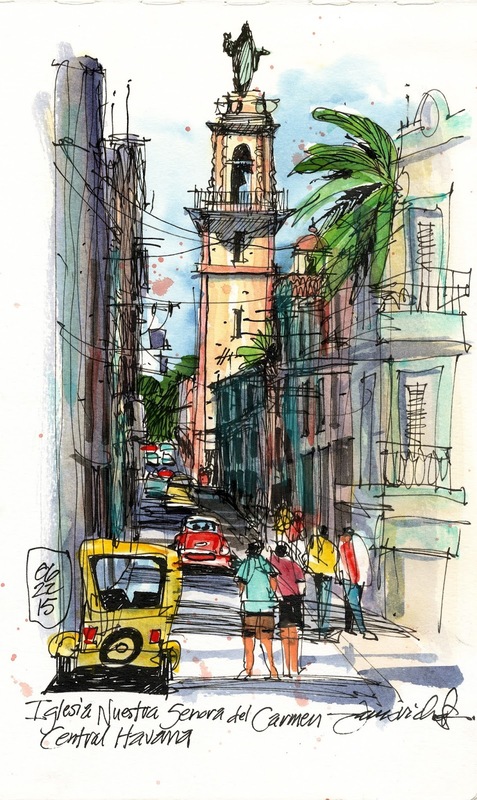 Our first trip was leading the 5-day "Sketch Cuba" tour, which is described in several posts below. For the second trip, my wife Patti and I traveled alone to retrieve my "Hemingway's Cuba" exhibition of sketches from Finca Vigia (Hemingway's home outside Havana, now a national museum) and bring it back to the U.S. 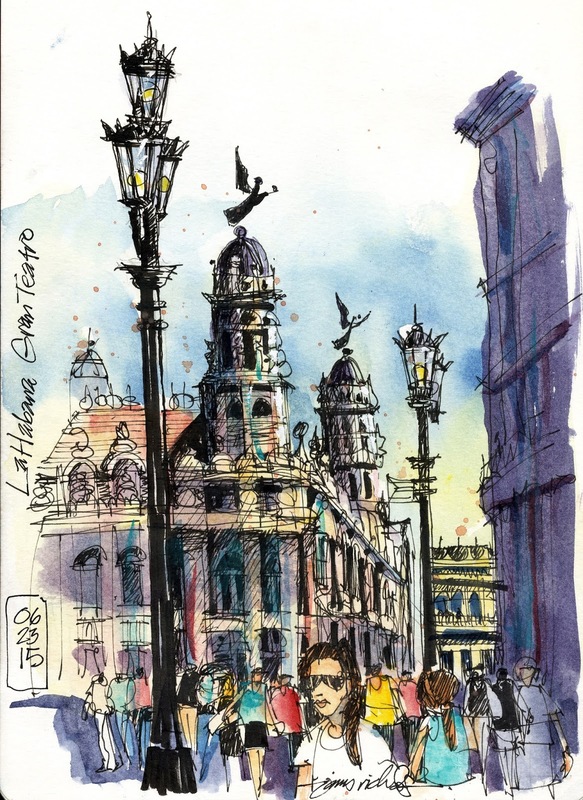 The second trip allowed for much more personal exploring and sketching, and ensuing interaction with friendly and curious locals. Recognizing the crushing poverty and the mind-boggling extent of the "elegant decay" that envelops the city, what I'm left with after days of exploring Havana on foot is the exuberant spirit of the people and their joy of living, and how that spirit and pride is embodied in the architecture, city design, visual arts, addictive music, celebratory street life and memorable food. 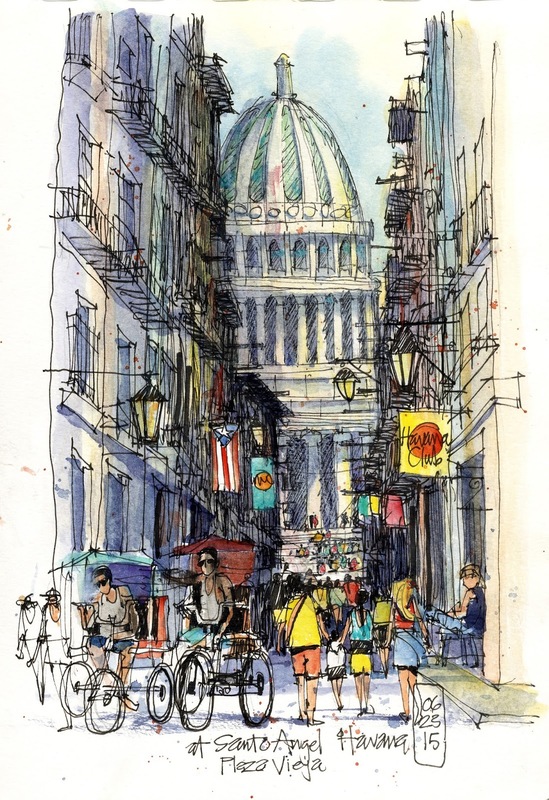 Will what is quintessentially Cuban survive the "normalization" of relations with the U.S.? After visiting three times in the last 13 months and having worked in the world of urban redevelopment for decades, I believe that it will. It will require vision, intelligence, creativity and patience. I found no shortage of those qualities in the Cuban people we met. These sketches were made while exploring Central Havana on foot. Be forewarned, they can't begin to adequately describe the visual richness of the city, but I hope they hint at what we saw. Enjoy. The classic bell tower of this cathedral punctuates the visual experience of this narrow street. The Capitolio, modeled after the U.S. Capitol but slightly taller, as seen from a cafe table in Plaza Vieja.